I'm not going to lie to you. 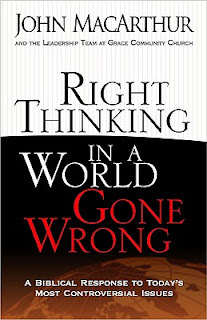 Right Thinking in a World Gone Wrong: A Biblical Response to Today's Most Controversial Issues is the wrong book to give me because it appeals to my desire to be right all of the time. What I mean by that is: I really, really liked this book. Almost in an unhealthy way. Here's my personality: I like to be as Biblically accurate as possible and dead right all the time. I just take the "dead" part of that way too seriously and am perfectly a.) ignorant or b.) willing to hurt people's feelings in my never ending drive to be right. I'm pathetic in this way, truly, and it's something I'm not exactly proud of. Actually, I'm not proud of it at all. Yes, a desire to be correct and to pursue truth is an asset - absolutely! But not when you are willing to sacrifice love and relationship as a result. Still, I really like Right Thinking in a World Gone Wrong . (Part of me just likes the title.) This book is comprised of a collection of articles written by John MacArthur and other leaders at Grace Community Church. It is suitably subtitled as being a Biblical Response to Today's Most Controversial Issues. When they say controversial, they mean controversial. Abortion, euthanasia, the economy, a Christian's political involvement, the entertainment industry, morality, illegal immigration - you name it! It's all inside! The purpose and point of this book is to look at each subject matter in the light of Scripture. The Introduction is probably one of the best introductions to a book that I have ever read. It is spot on for the rest of the book. MacArthur introduces this collection of writings by first defending the inerrancy of scripture which, in some ways, I find regrettable. By that I mean it's regrettable that he HAD to do it, but in this modern age he really did need to do that. I thought he did a good job explaining why Christians need to look at Scripture and defending its accuracy. It sets the stage for the rest of the book very well. Now, this book has great appeal to a first born, type A, black and white individual. That being said, I'm going to admit that I skimmed it. I skimmed it because I knew that a.) I probably DID agree with the conclusions of the book and b.) it probably wouldn't be a good idea for me to delve into this work so completely BECAUSE it would energize and charge me up in a way that I like to avoid charging myself. I'm working really hard these days at "toning down" and letting love truly dictate, rather than love of truth. There IS a distinction in that. One seems to have the ability to grow truth and the other kills it. I'm not entirely sure WHY that is and I can say that I don't always understand and/or like it. But it still seems to be true. From everything that I did read (I read every other chapter, lightly) I cannot see that the authors of this book desire anything less than to love people who might disagree with them. However, they are also quite weary (rightfully so, I might add!) of the attitude that says we should ignore scriptures if that would help someone to feel more loved. The point that they are making with this book is that we've walked so far away from scripture that we are unable to love properly. I agree wholeheartedly with them in that, although I know that I need to exercise some internal caution when I say that. I'm a black and white kinda gal. Gray? What IS that? I don't know. I know it exists because other people tell me so, not from personal experience. My father always said that I was no wilting violet and that I didn't lack in the opinion department. All of that is true. What has changed in me is that I acknowledge the fact that although I can't see the gray, it does exist and I need to listen for hints of it. That said, I particularly appreciated the fact that this book goes out of its way to address the "gray" subject matters and talks about how we need to glorify God in the gray as well. This makes my black and white mind feel better somehow. Yes, gray exists. But I'm not exempt from the call to glorify God in it. But gray is gray and it allows some flexibility in living. Flexibility is a good thing, right? At least, that's what I'm told. Seriously, I think this is a great book for those who are grappling with the issues this book addresses. I'm entertained AND encouraged by MacArthur's thoughts on internet dating. I think he makes some good arguments against it while simultaneously admitting it works for people. Gray. Glorify God in it. I thought the article on American Idol (written by Tom Patton) was well thought out. It's a hard hitting book and one that holds great appeal to me. It just holds so much appeal that I needed to tread lightly, if that makes sense. I still want to be Biblically accurate. I also want to remember that the greatest thing of all is love and love is precisely the thing that allows me the ability to be black and white and know that I am forgiven for it. This sounds like a great book, Carrie, and you are very wise in your "(t)reading lightly"! I think I'll have to track this one down -- I appreciate Christian writers who address the gray areas. There are so many in life. How the list of "Reasons We Were Meant to Be Friends" grows and grows. "...letting love truly dictate, rather than love of truth..." - that is truly profound. As a fellow first born, type A, black/white type of gal, I need that phrase imbedded in my thinking so it will influence my actions, especially with my children. Thanks for such an eloquent reminder.